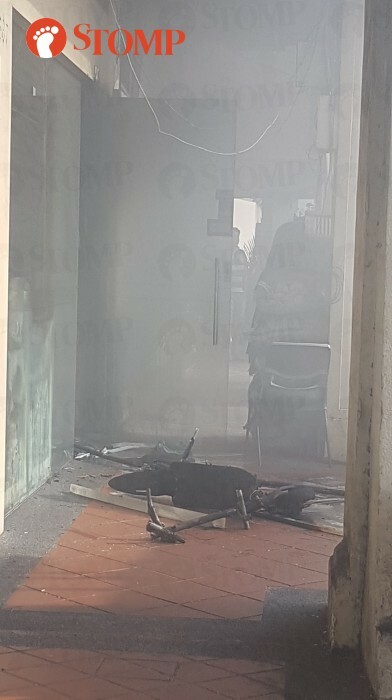 A fire involving two e-scooters broke out this morning (Jan 7) outside a shophouse at 587 Serangoon Road, near Boon Keng MRT Station and Farrer Park MRT Station. Stomper Jem Sanchez was on the third floor of the Singapore Teachers' Union's building nearby and smelt smoke. He said: "I was in my office, which is in an enclosed space when I smelt burning rubber or electricity of some sort. "Then, we were alerted by the human resources department of our company to evacuate the building to the first floor as a precautionary measure. "When I stepped out of the building and was at the ground floor, I could see smoke and officers from the Singapore Civil Defence Force (SCDF) were there." Jem then took pictures of his surroundings and videos of the officers in action and sent them to Stomp. In response to a Stomp query, the SCDF said: "On Jan 6 at about 8.53am, the SCDF was alerted to a fire involving two e-scooters at 587 Serangoon Road. "The fire was extinguished using two compressed air foam backpacks. In one of the pictures he sent, a charred e-scooter can be seen lying on the ground with thick smoke around the area. The Stomper added: "I work with servers and computers, so I was quite afraid that the fire would spread. If it did, the company's servers would be down."